Absolutely, I truly appreciate the "extra mile" you have gone and will be happy to recommend your website!! Tony Lama Ladies Vaquero Western boot in Clay Santa Fe Leather Foot with Tan Tooled Wingtip and 11 Inch Clay Santa Fe Top featuring a Cushion Insole for all day comfort. 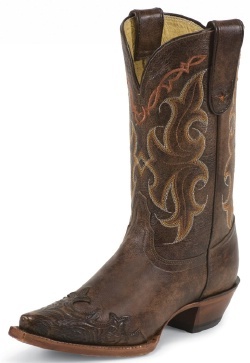 This boot also features a Narrow Square Toe with Low Profile Western Heel and Leather Outsole for long wear. Offering styles with genuine leather outsoles or performance rubber , the 100% Vaquero Series is ideal for those who need a comfortable boot with maximum functionality. Combining cushion comfort footbeds, flexibility and maximum moisture wicking ability, these boots are essential to every western wardrobe. Tony Lama Boots, makers of fine quality western boots since 1911. Get your boots from Lonestar boots where the owner has over 25 years of boot experience and is willing to get you the best price possible. Tony Lama Ladies Vaquero Western Boot with Clay Santa Fe Leather Foot with Tan Tooled Wingtip and 11 Inch Clay Santa Fe Top featuring a Cushion Insole for all day comfort. Worn by U.S. presidents, movie stars, rodeo legends and country music icons, Tony Lama boots have been engraved on the Great American landscape for 100 years.